Mix juice, olive oil, garlic and crushed red pepper in a very bowl. Add shrimp, mangoes and pineapple. Toss well and season with salt and pepper. Prepare a charcoal fireplace and let burn to a grey ash (or heat up a gas grill to medium). Drain shrimp, mango and pineapple and pat dry, reserving liquid. Thread on metal skewers, alternating shrimp and fruit. Brush with reserved liquid and season with salt and pepper. 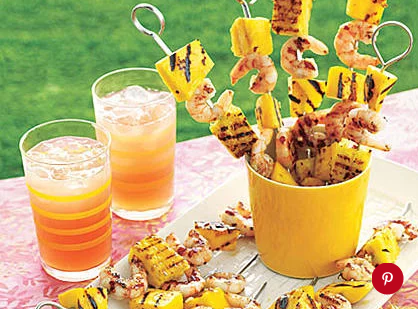 Grill till shrimp is medium through and pineapple is gently bronzed, regarding three minutes per facet. Serve warm. 0 Response to "Fruity Grilled Shrimp Skewers"